The HOPE stencil is designed to be stencilled on a 4"/10cm wide cookie. 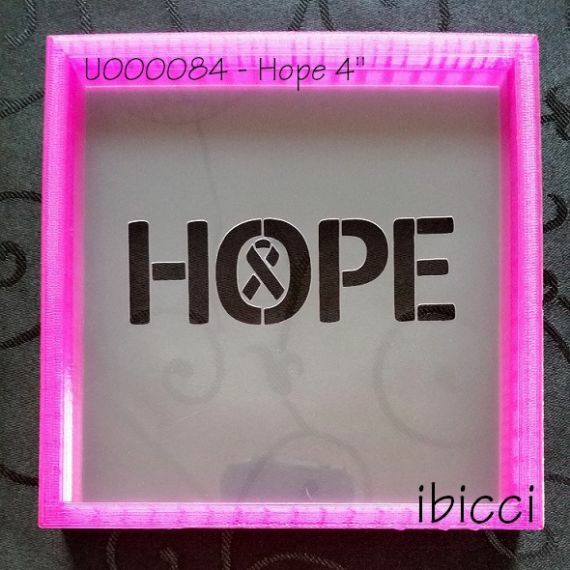 Most of us are touched by Cancer at some stage in our lives, or know of injustices or minority struggles, or Medical research associations and so I have already loaded a permanent discount on all Hope Awareness stencils on this website. For Americans, Click here http://www.awarenessdepot.com/awarenesscalendar.html for a list (as shown below) that also gives the coloured ribbons used by each organisation. I'm Fine / Save Me Ambigram Stencil designed to use with airbrush or royal icing and craftwork.